Scaly skin is not usually a very serious skin problem, but it can be caused by health conditions which can be more serious themselves. How do I know if I have scaly skin? What can I do about scaly skin? Is scaly skin a bad sign? What causes the scaliness? – scaly skin in all of these conditions is caused by the outer layer of the skin (called the epidermis) falling away in flakes. It can be triggered by a lot of different things, such as allergens, changes in the environment (such as dryness or humidity), or an infection (for example, by a fungus). Pre-existing skin conditions can lead to scaly skin – a person could be susceptible to developing scaly skin if they have certain skin conditions like psoriasis or eczema. You can also develop scaly skin if your skin is sensitive to a particular substance and you come into contact with it. Skin conditions like these are often genetic – many skin conditions are partly influenced by genetics, so you are more likely to develop conditions that cause scaly skin if a close relative also has the condition. 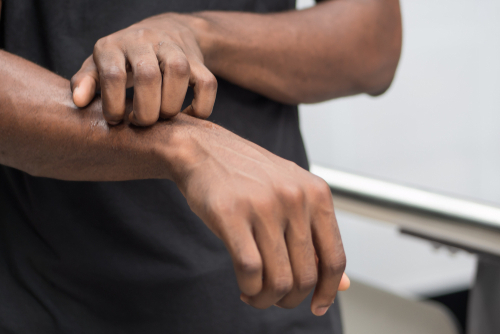 These conditions are also quite common, with up to one in ten people affected by psoriasis and up to one in five affected by eczema. Report symptoms to a doctor – you may have scaly skin if your skin looks very dry and flaky. It’s often quite difficult to tell the difference between scaly skin and other skin complaints. So, if you’re concerned about having scaly skin, it’s important to make an appointment with your usual GP. How to improve appearance of scaly skin – to improve the appearance of scaly skin or reduce symptoms such as itch or pain, you can use topical ointments. Sometimes these are simply fragrance-free moisturisers which keep your skin from becoming too dry. Some ointments contain medicines that can help to heal the skin and reduce the inflammation. Getting scaly skin can have some health implications – some health conditions are related to each other, which means that getting diagnosed with one increases the chances of being diagnosed with the others. Some conditions that cause scaly skin can affect people for life – however, knowing your triggers and with the right care, you can drastically reduce the effect that the conditions can have in your life. Having scaly skin can increase the chances of getting a skin infection – this is because the barrier layer between the skin and the environment is compromised. However, keeping your skin moisturised and clean reduces the chance of getting an infection. Alinaghi, F. et al (2018). Prevalence of psoriatic arthritis in patients with psoriasis: a systematic review and meta-analysis of observational and clinical studies. Journal of the American Academy of Dermatology. Asthma UK (2016). What is asthma? [online] Available at: https://www.asthma.org.uk/advice/understanding-asthma/what-is-asthma/ [accessed 26th September 2018]. Campbell, R. L. and Kelso, J. M. (2018). Anaphylaxis: acute diagnosis. UpToDate. [online] Available at: https://www.uptodate.com/contents/anaphylaxis-acute-diagnosis [accessed 26th September 2018]. Dellavell, R. P. and Duffin, K. C. (2018). Epidemiology, clinical manifestations, and diagnosis of psoriasis. UpToDate. [online] Available at: https://www.uptodate.com/contents/epidemiology-clinical-manifestations-and-diagnosis-of-psoriasisWEhjdAfgkh [accessed 26th September 2018]. Gelfand, J. M. (2016). Psoriasis, diabetes, and obesity: weighing the evidence. JAMA Dermatol, Jul; 152(7): 753–754. Goldstein, A. O. and Goldstein, B. G. (2018). Dermatophyte (tinea) infections. UpToDate. [online] Available at: https://www.uptodate.com/contents/dermatophyte-tinea-infections [accessed 26th September 2018]. Hu, S. C.-S. and Lan, C.-C. E. (2017). Psoriasis and cardiovascular comorbidities: focusing on severe vascular events, cardiovascular risk factors and implications for treatment. Int J Mol Sci, Oct; 18(10): 2211. Jackson, R. (1978). A dissertation on some of the terms used to describe the living gross pathology of the human skin. Clinical and experimental dermatology, Sep; 3(3): 241-247. Michalek, I. M., Loring, B. and John, S. M. (2017). A systematic review of worldwide epidemiology of psoriasis. J Eur Acad Dermatol Venereol. ; 31(2): 205. Weston, W. L. and Howe, W. (2018). Atopic dermatitis (eczema): pathogenesis, clinical manifestations, and diagnosis. UpToDate. [online] Available at: https://www.uptodate.com/contents/atopic-dermatitis-eczema-pathogenesis-clinical-manifestations-and-diagnosis [accessed 26th September 2018]. Williams, H. et al (1999). Worldwide variations in the prevalence of symptoms of atopic eczema in the International Study of Asthma and Allergies in Childhood. J Allergy Clin Immunol. ; 103(1 Pt 1): 125. Yiannias, J. (2017). Clinical features and diagnosis of allergic contact dermatitis. UpToDate. [online] Available at: https://www.uptodate.com/contents/clinical-features-and-diagnosis-of-allergic-contact-dermatitis [accessed 26th September 2018].